M Membership of the British Hyperbaric Association is made up of representatives from hyperbaric facilities all around the British Isles. Listed below are the member chambers along with location, contact and further information. Medical Director: Dr Mark Glover. Medical Director: Dr Pieter Bothma. Based in Aberdeen, Scotland, the Hyperbaric Medicine Unit provides recompression treatment for decompression illness (DCI) and Hyperbaric Oxygen Therapy (HBOT) osteoradionecrosis, soft tissue radiation injury and other wounds and infections. The Hyperbaric Medicine Unit is based at Aberdeen Royal Infirmary (ARI) and is located in the National Hyperbaric Centre (NHC). The Unit is funded by the National Services Division of NHS Scotland to provide medical treatment and advice for diving related illness. The Unit also provides treatment for other conditions that have been shown to respond well to Hyperbaric Oxygen Therapy. 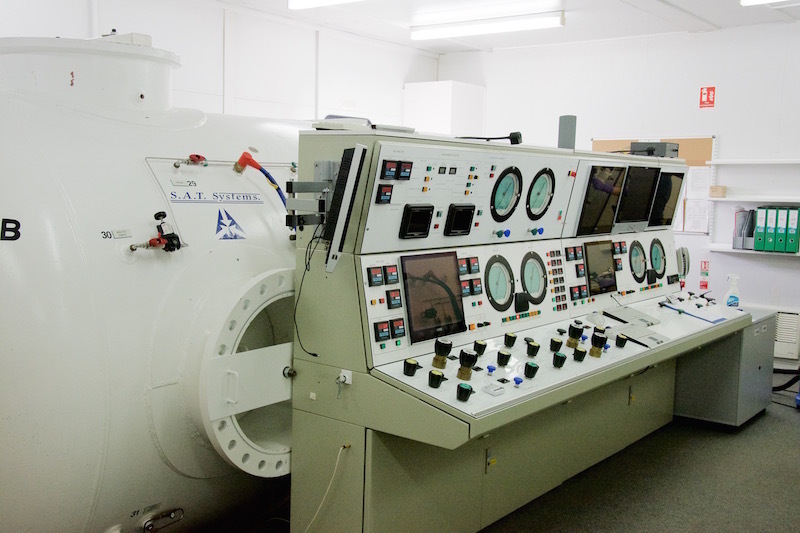 There are four classifications of chamber used by the British Hyperbaric Association (BHA). Our Unit is classed as the highest, category 1 – the only one in Scotland capable of providing intensive care support in a hyperbaric environment. The Unit has access to the hospital’s on-site helipad for reception of casualties from distant locations either directly from the scene via coastguard, navy or airforce rescue helicopter or from another facility. Patients may also arrive by fixed-wing aircraft at Aberdeen airport. Medical, nursing and technical staff are on call 24 hours per day. The nurses who cover routine treatments and emergency cases at the Unit are based in the Intensive Therapy Unit of ARI and have all undergone training in hyperbaric nursing in addition to existing critical care training. We also support diving related NHS cases treated elsewhere in Scotland, with the consultants providing medical advice. 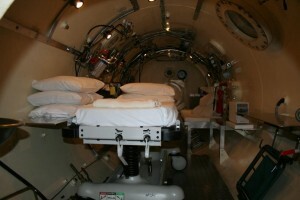 The Unit’s chamber is maintained by the National Hyperbaric Centre who also provide support staff to enable the Unit’s chamber to operate 24 hours per day. The chamber is 7.8m long, 2.2m in diameter, 30.4m³ in volume and is rated to a working depth of 300msw (31ata). There are two fixed bunks and a moveable Stryker trolley as used in some Accident and Emergency departments. A respiratory ventilator, suction apparatus and electronic monitoring equipment enable the chamber to be used for the treatment of critically ill patients. There is also full critical care equipment available including a cardiac defibrillator and emergency drugs. The chamber is linked to several others operated by the NHC, which can be used to treat multiple casualties. The entry lock in our chamber allows equipment and additional personnel to be compressed to the working depth as required. Small items, food, drugs or samples can be passed in or out through a small medical lock. LHM Healthcare (incorporating The Diver’s Emergency Service) provides a range of hyperbaric, clinical and specialist services to the NHS, private commissioners, the Armed Forces, private patients and commercial clients. 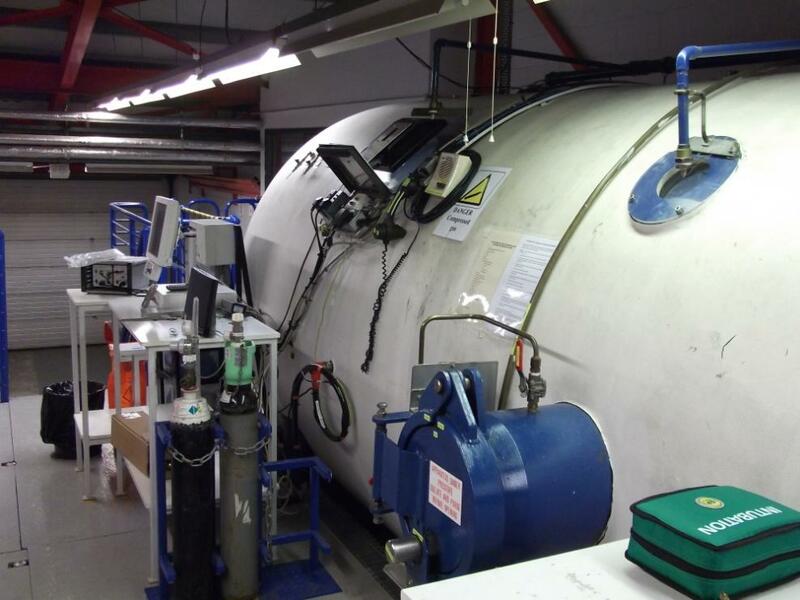 Our Class 1 hyperbaric facility, based at Whipps Cross University Hospital, is fully registered with the Care Quality Commission and is staffed, equipped and registered to admit critically ill patients. 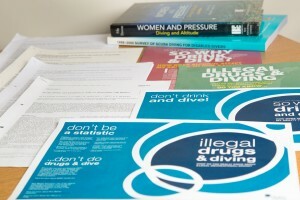 First Aid and safety advice aimed at preventing DCI and Diving Accidents. 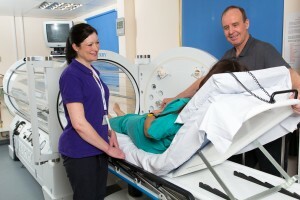 LHM Healthcare has made important and significant contributions to the work of NHS England’s Clinical Reference and Clinical Advisory Groups; actively promotes and participates in research into Hyperbaric Oxygen Therapy (HBOT); and even provide specialist Hyperbaric services for the civil engineering industry. We also facilitate medical and hyperbaric training courses aimed specifically at both medical professionals and the diving community. 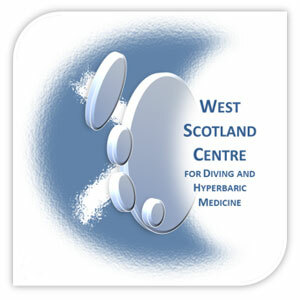 The West Scotland Centre for Diving and Hyperbaric Medicine is hosted by the Scottish Association for Marine Science (SAMS: www.sams.ac.uk) near Oban on the west coast of Scotland. The recompression facility was established at SAMS in the late 1960s to support its own scientific diving operations but was approached in the early 1970s to provide emergency cover for decompression incidents occurring in the region. The facility was one of the founder members of the BHA and has always been part of the Scottish NHS Registration Service for Emergency Recompression. It is currently one of three NHS-registered recompression facilities in Scotland and covers the whole of the west coast of Scotland including the outer isles. The current recompression chamber was installed in 1998. It is a 2-metre diameter twin-lock Divex chamber with 900mm diameter doors. It has the capability of treating two patients at once and can provide standard air-oxygen recompression treatments and heliox-oxygen-air tables. The Facility is operational 24 hours, 7 days a week; emergency call-outs can be initiated through the Coastguard (999, channel 16) or the Scottish National Helpline number 0345 408 6008. 3. To increase the safety of divers in Orkney by running appropriate training courses and improving first aid and triage of accidents. The trust aims to keep the costs charged to both the NHS and the independent sector as low as we can. Any treatments we carry out must be justified by as strong an evidence base as possible and supported by a robust governance structure. Surplus income is reinvested in the service for the benefit of future divers. OHU has a 2 metre diameter triple lock chamber designed and built for the unit. We have the capability to deliver heliox treatments but the majority of patients are treated with air tables. The Orkney hyperbaric unit is for the treatment of divers involved in accidents. We do not currently do any elective non-diving related treatments. We work as part of the Scottish chamber network and manage all of our treatments in conjunction with the Aberdeen hyperbaric unit. In addition to the importance of sharing the clinical experience of a small number of treatments to improve overall expertise within the Scottish network, this improves clinical governance and allows continuity of care should any more complex treatment or investigations be necessary outwith the scope of the Orkney unit. The unit is audited triennially as part of the Scottish Chamber network. OHU has four doctors trained in diving medicine. We currently have 10 trained chamber attendants and 3 permanent and 2 relief chamber operators. All of the attendants are trained within the unit with annual training courses for new staff and obligatory refresher training annually for all staff. In addition we run a range of evening educational meetings and plan to establish video conferencing in the unit this year to broaden our educational connections. DDRC Healthcare, Hyperbaric Medical Centre, is a not-for-profit organisation (registered charity no. 279652) established as the Diving Diseases Research Centre in 1980. The charity is based at Plymouth Science Park adjacent to Plymouth’s Derriford Hospital & Major Trauma Centre and operates a satellite hyperbaric unit at the Spire Cardiff Hospital, Wales. 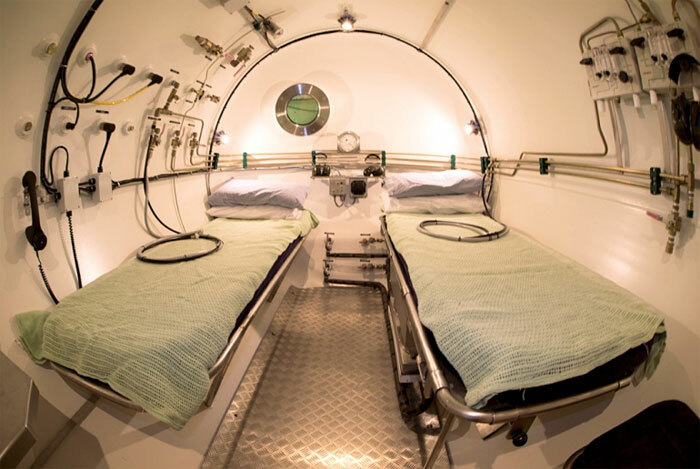 Our primary aim is to promote and deliver treatment, training, research and education associated with the use of hyperbaric oxygen therapy (HBO or HBOT) to emergency and elective patients. We are a Category 1 facility and house 1 Krug chamber, 2 Comex and 1 Monoplace. 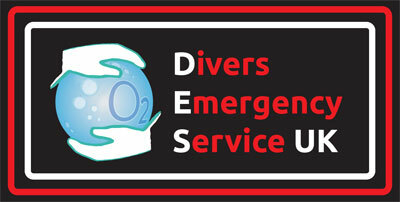 We also support the diving, marine and offshore communities by providing hyperbaric and medical treatment, on-call advice, medical training and occupational medicals through our trading subsidiary, DDRC Professional Services Ltd and we can also offer Companies our Diving Emergency Medical Advice Scheme. DDRC Wound Care was established in 2011 (initially as Plymouth Wound Care Ltd) and offers specialist care to the public for a variety of wounds, but with emphasis on treating difficult to heal chronic wounds including leg ulcers. Our two not-for-profit subsidiaries, DDRC Professional Services Ltd. and DDRC Medical Services Ltd. gift any income generated to DDRC Healthcare to support our charitable work. Midlands Diving Chamber is a hyperbaric facility situated in the heart of the UK in Rugby, Warwickshire. Dual chamber access via floor level door and round door access. As a Cox Category 1 chamber, we can take any patient, in any diagnostic condition from mild symptoms, through to ventilatory support for the critically ill, including full patient monitoring. Fully equipped saturation chamber with full mixed gases facility and a 34.4 bar capability. Second chamber is a medical facility which features a walk-in door and can hold up to 10 seated patients or 4 hospital trolleys. 24/7 365 days a year, we offer an emergency service for diving accidents, carbon monoxide poisoning and other life threatening conditions. 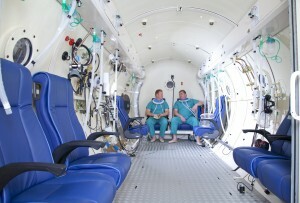 Capable of dealing with any hyperbaric emergency, including patients requiring full intensive support. Multiple patients can be treated. Intensive care facilities within both chambers including the ability to defibrillate. Helipad immediately adjacent to the Unit-allowing immediate access to resuscitation room and chambers. 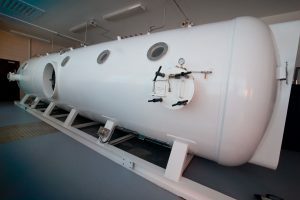 Hyperbaric Oxygen Treatment for air and gas embolisms, DCI, gas gangrene, necrotising fasciitis, post- radiotherapy tissue damage, preparation for surgery in previously irradiated tissue amongst other clinical conditions. One of 9 Cox Category 1 chambers in the UK. Care Quality Commission registered facility, 22 years experience. Team is led by Dr Tristan Cope Mb ChB FRCA- Hyperbaric Medicine Consultant and comprises specialists in anaesthesia, intensive care and hyperbaric medicine. They are supported by ICU nurses and a strong technical support team providing expert care.